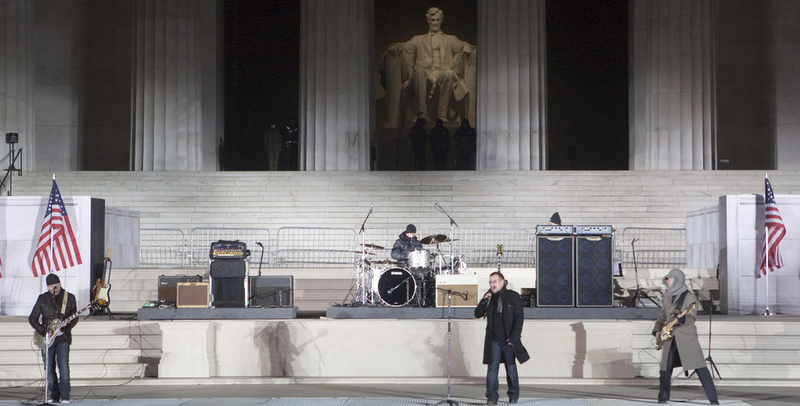 U2 perform on the steps of the Lincoln Memorial. I was all set to write about the great band I saw last night, but this was too hard to resist… The first single from the new U2 album No Line on the Horizon made its debut on Irish radio this morning. “Get Your Boots On” makes it’s debut on the Happy Medium Song of the Day this afternoon. I like it. It’s a terrific slice of raunch n’ roll with a rockin’ beat, fuzzy overdriven guitar and bass, and fun lyrics that don’t try to take on all the world’s problems in three and a half minutes. Love ‘em or hate ‘em, it can’t be denied that these “four lads from the North side of Dublin” are still making vital, interesting music with a passion and sincerity that few can rival. There’s a reason why they were the only foreigners playing on the Mall yesterday. Let me in the sound, let me in the sound, let me in the sound. Yeah!